In real project development, you might need a data flow solution like Redux or MobX. Ant Design React is a UI library that can be used with any data flow solution and application framework within the React ecosystem. We have launched dva based on Redux, as well as a pluggable enterprise application framework umi, which is recommended for use in your projects. Dva is a lightweight data flow solution based on Redux. The concept comes from elm. It supports side effects, hot module replacement, dynamic loading, react-native, SSR, etc. It has been widely used in production. And umi is a routing-based framework that supports next.js-like conventional routing and various advanced routing functions, such as routing-level on-demand loading. With a complete plugin system that covers every life cycle from source code to build product, umi is able to support various functional extensions and business needs. You may also be interested in Ant Design Pro, an Out-of-box UI solution for enterprise applications based on umi, dva and ant design. This article will guide you to create a simple application from zero using umi, dva and antd. It is recommended to use yarn to create an application and execute the following command. If you insist on using npm, execute npm install -g create-umi && create-umi and the effect will be the same. Yarn will install the latest version of create-umi and then create the app with interactive ui. Select app and press Enter to confirm. Select antd and dva and press Enter to confirm. 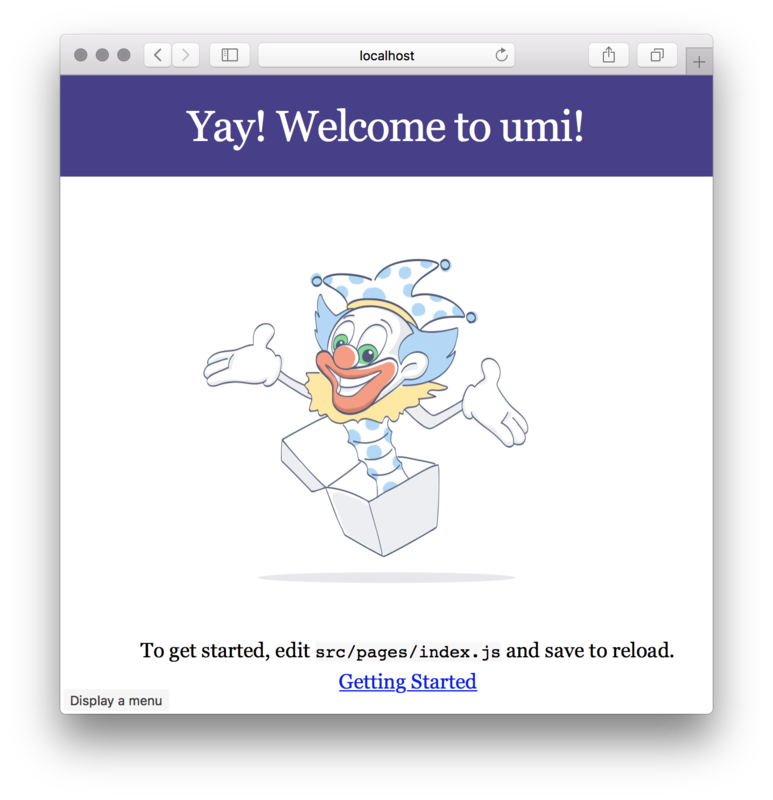 Open http://localhost:8000 in your browser, you will see the welcome page of umi. After selecting antd earlier, antd's dependencies are automatically handled and loaded on demand. You can check the configuration in .umirc.js to make sure antd is turned on. And if you want to use a fixed version of antd, you can install additional antd dependency in your project, and the antd dependencies declared in package.json will be used first. We need to write an application displaying the list of products. The first step is to create a route. If you don't have npx, you need to install it first to execute the commands under node_modules. Then open http://localhost:8000/products in your browser and you should see the corresponding page. As your application grows and you notice you are sharing UI elements between multiple pages (or using them multiple times on the same page), in umi it's called reusable components. Let's create a ProductList component that we can use in multiple places to show a list of products. After completing the UI, we will begin processing the data and logic. dva manages the domain model with model, with reducers for synchronous state updates, effects for async logic, and subscriptions for data source subscribe. In umi, the model files under src/models will be automatically injected, you don't need to inject manually. So far, we have completed a separate model and component. How do we connect them together? dva provides a connect method. If you are familiar with redux, this connect is from react-redux. How to handle onError globally and locally?